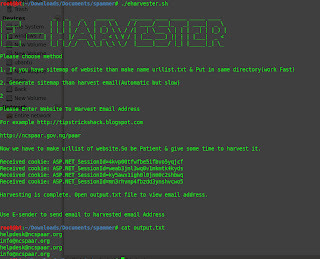 Home » Information Gathering » Extract email address from given domain. Extract email address from given domain. Yesterday i created simple script which extract email address from given Domain. We can gather email address from whois info; pgp key search ;domain name. 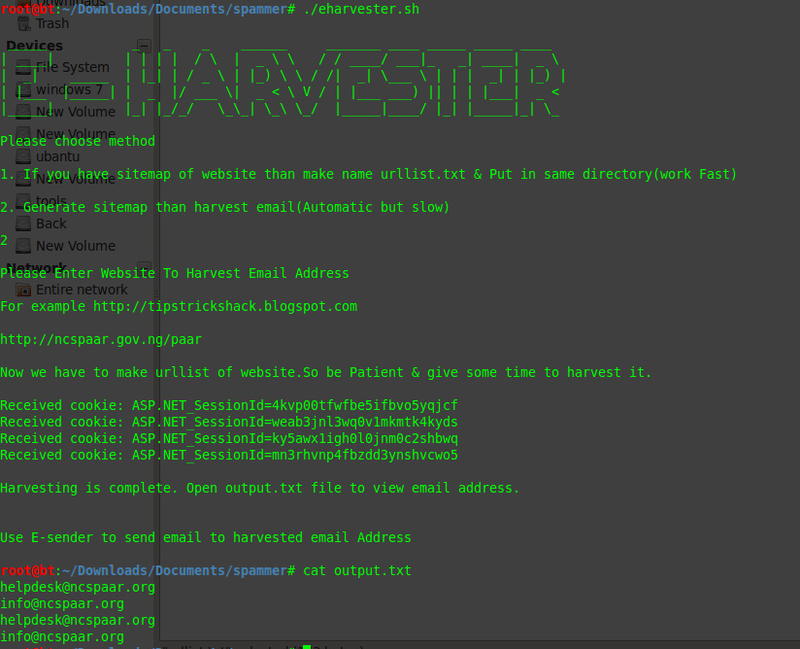 With help of this script we can extract email address which are on the specified web page.In backtrack there is tool available which is uberharvester. It has many features ; but for small website it takes too much time to extract information.But this script work fast for small website. Speed of script depends on loading time of website and number of web pages. Script working in two mode. (1)In first mode we have to supply sitemap of website, so script can crawl that webpage one by one & extract email address. For example if your victim website is fakesite.com then go to http://xml-sitemaps.com/ & create sitemap & download it in text format and save it to same folder where script is located. (2)Second mode is automatic ;you have to just supply Domain name ; script crawl domain & create sitemap for you & then extract email address from website.This mode is very slow compare to first. If you want to download script & want to use it .Go to following link . It`s bash script ; if you will write script in python ; you can enhanced crawling process.I also add other simple script with help of it you can send email to extracted address one by one. Exploit Oracle Endeca Server with metasploit. Post exploitation & swaparoo backdoor. Bypass AV using Veil In Backtrack. Extract skype & firefox data after exploitation. How to use Browser Exploitation Framework?